Covering an event that includes writing about a “big city” TV journalist and author who gets paid to travel our great state combined with one of my personal Top-5 restaurants on the beach — Capt’n Franks — and the story almost writes itself. Here on the Outer Banks we’re cut off from Raleigh television on cable and satellite. But many of our readers are very familiar with WRAL-TV 5 and “Tar Heel Traveler” Scott Mason. Mason’s travels are a regular part of WRAL’s news programming. 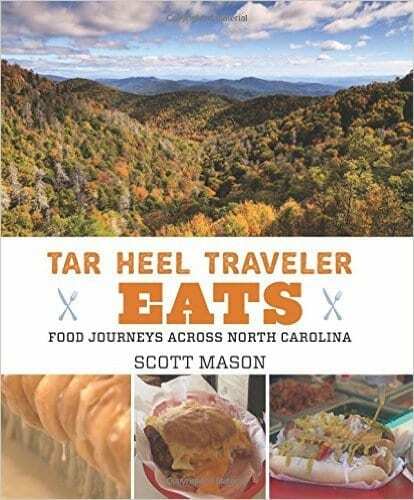 He has written two books about his Carolina journeys, Tar Heel Traveler, which focuses on the some of his favorite locales, and his latest effort Tar Heel Traveler Eats, which obviously covers Mason’s favorite epicurean adventures. This book is not a collection of restaurant reviews. 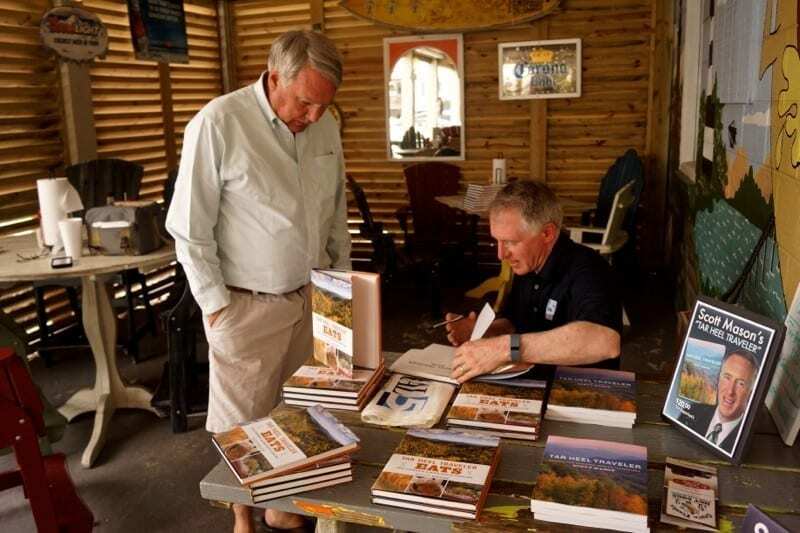 Instead, each chapter features legendary places that every North Carolinian should put on their bucket list and reads like a homespun narrative told from the first-person perspective of the writer. Mason’s style is conversational — he includes any traveling companions in each vignette, conversations with owners and customers and even insights into his craft and how he puts together strings of interviews and video into a coherent and succinct TV news segment. Locals will immediately recognize this establishment, but for someone who has never been to Capt’n Franks, that single paragraph is enough to both capture the essence of the restaurant and entice one to visit. And so it was that Scott Mason was at Capt’n Franks on Wednesday while visiting the area for a half dozen segments he was shooting for his “Tar Heel Traveler” news segment. He set aside two hours from his crammed schedule and held an impromptu book signing on the outside deck of my favorite hot dog place on the beach, if not the entire planet. Mason is as affable and down-to-earth as his TV persona and writing style reveal. He loves his job, he loves people, the state, it’s natural wonders, the small towns and big cities, and of course, the food. Mason’s book focuses on the real North Carolina and the restaurants that are legendary, but not in the New York Time’s haute cuisine style of dining. He brings to life the places that are legends in small and big towns alike but probably overlooked by the casual tourist or businessperson on a mission. Think of Bill’s Hot Dogs in Washington, NC, B’s Barbecue outside of Greenville, Yum Yum in Greensboro, City Lunch Cafe near Raleigh. I love this book because the focus is on simple North Carolina fare. What you’ll find within these 200 pages are a number of hot dog joints, burger dives, barbeque shacks, old school downtown grills and traditional ice cream, bakery and dessert stops. Mason sold a few books during his two hours at Capt’n Franks, talked to locals and wrote down their suggestions for places he needed to explore for future segments of “The Tar Heel Traveler,” and in the small world that is the Outer Banks, even ran into some of his friends from church and social circles who were here on vacation and serendipitously stopped by Capt’n Franks for lunch. I became a fan of the book while perusing it during our interview and gladly purchased a copy. I can’t put it down and I’m already planning trips for myself and the Voice based upon the many places I haven’t yet visited but now feel I must add to my list (I have been to seven of the 37 restaurants he covers). I also checked out The Tar Heel Traveler on WRAL’s website, where segments are archived and added it to my “must visit” list. There is a lot of North Carolina I have yet to experience and I now have my own “personal” guide to steer me to those locales.